With Easter weekend approaching and two bank holidays to enjoy, what better time to invest in a pair of shorts, a T-shirt or sneakers. Our new Spring Summer 2019 collection boasts all of these and more. Read on for our top picks of the latest menswear by Farah, Marc Darcy, John White and more. Tired of the same old T-Shirt styles? This new Farah arrival shakes things up with a ribbed crew neck and handy chest pocket. Available in two colours – Clay and Pink Haze – this T-shirt boasts Farah’s trademark semi-slim fit, a touch slimmer than most other brands. Made from soft 100% cotton, the slub effect fabric keeps you cool and comfortable during those hot summer days. The chest pocket is ideal for storing your glasses or even a smart-phone. Sizes range from Medium to Extra Large. For something a little more quirky, Farah have also brought out a range of patterned T-shirts, each with a memorable design. 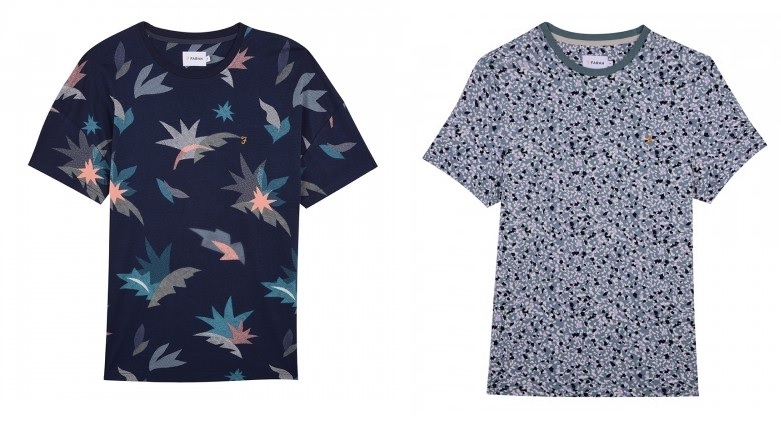 Here’s a couple of our favourites — the navy “Keats” T-shirt adorned with star-shaped leaves, and a camo-style print T-shirt in Clay (pictured) and Navy. 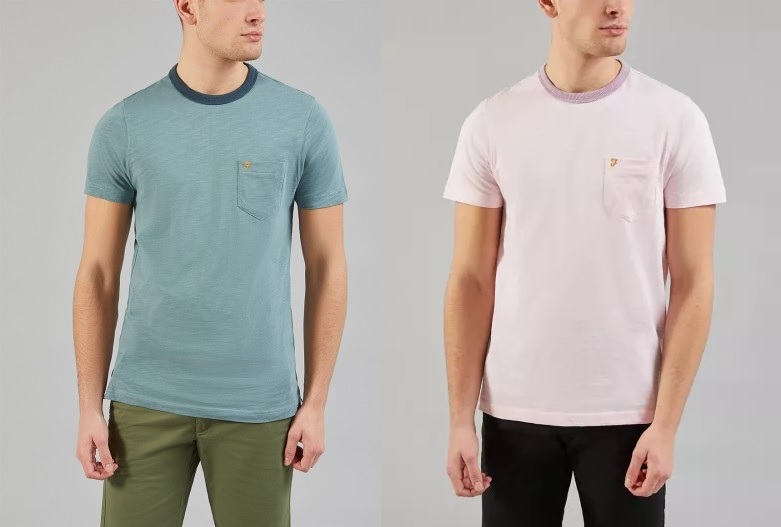 Browse our extensive range of Farah patterned and plain T-shirts here, including half-price T-shirts from last season. At Apache we are very selective when it comes to footwear. 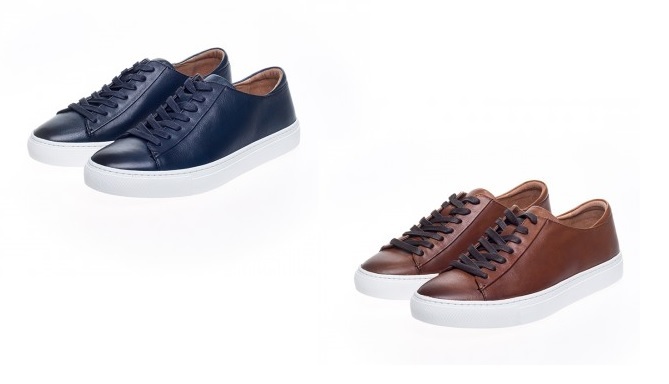 So when we saw John White’s perfect blend of smart style and casual sneaker, we simply had to have it. The latest version of this popular shoe boasts high quality “tumble” sports leather with a gorgeous soft handle. Extra comfort is provided by the durable rubber sole, memory foam insole and special “comfort tongue”. The two colours (Navy and Tan) are back by popular demand having proven a huge hit among our customers in seasons gone by. Sizes range from 7 to 11 in both colours. No short is better suited to a warm summer than a classic tailored chino short by Farah. Smart, versatile and comfortable, we’ve run this garment for years in ever-changing seasonal colours. Boasting a crisp twill cotton fabric with a hint of stretch, there’s also buttoned back pockets for extra security. Our three colours for Spring Summer 2019 are Light Sand, Black and Blue Star and sizes range from 30 to 36in waist. Why not add a colourful “Gaucho” belt by Ibex for the complete look. In less than two years, Marc Darcy has established itself as one of our premier brands. The amazing quality of their suits have won admirers far and wide; not to mention the very reasonable price tags! New for Spring Summer 2019, this “York” suit has a much lighter fabric than usual, intended to be worn in summertime for weddings, outdoor events etc. 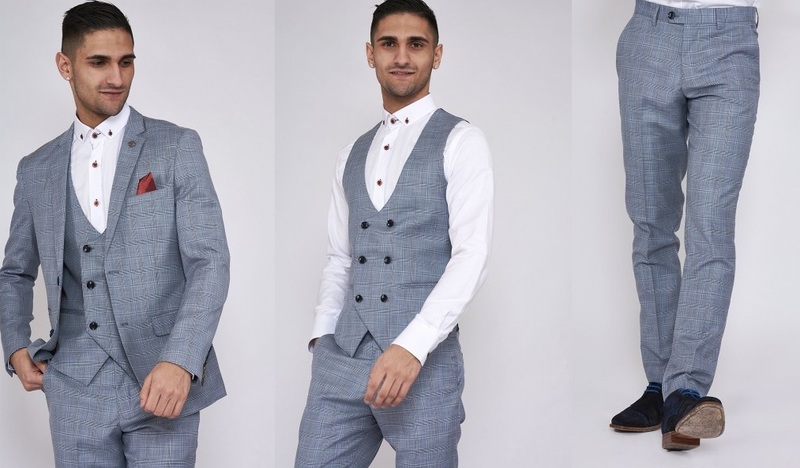 With a double-breasted waistcoat, all-over grey check pattern and gorgeous red lining under the suit jacket, it’ll certainly leave an impression. You can buy the blazer jacket, waistcoat and trousers together or separately. Sizes range from 38 to 48in in the jacket and waistcoat, and 30-40in in the trousers. We can in special cases order other sizes big or small including in some cases childrens ! Don’t go anywhere this summer without a stylish piece of headwear to keep the sun’s rays off your skull! 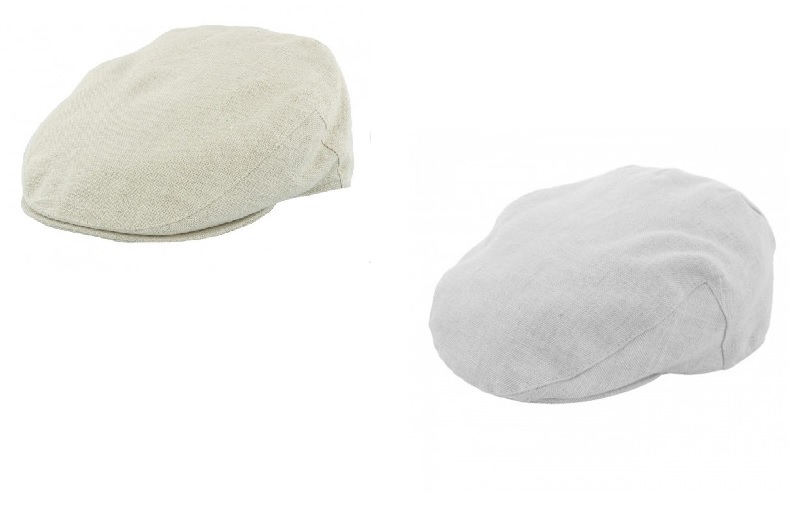 One great option is a light-coloured flat cap by Failsworth made with real Irish linen. As a high-performing natural fibre, linen is even stronger and faster-drying than cotton, which makes it the perfect material for headwear. Available in Natural and Dove Grey in Medium (57cm) and Large (59cm).